Boy no.3 is 4 and will start his first year at full time school next month. He's already started learning to read and is very interested in sounds and words. He can 'sound out' some simple words like 'Dad' and 'cat' and knows a lot of his letters, so it's time to start beginning to read. Orion Books have a huge range of books for children, including Early Readers - with a Blue Band for experienced readers and children to share together, and a Red Band for children to read alone. We have been sent a copy of a blue banded book 'Mondays At Monster School' by Ruth Louise Symes and illustrated by Rosie Reeve. This book tells the story of Fred, who is the youngest in his family and about to go to school for his first day. He's nervous and doesn't want to go until he finds out his friend also feels the same and he realises he isn't alone. He talks his friend into going, and in doing so, also reassures himself. It's a very sweet little tale, and the fact that they are monsters makes it very accessible and interesting to a 4 or 5 year old. 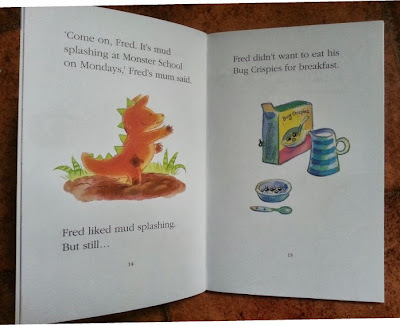 There is plenty of repetition in the language, and simple words that can be 'sounded out' and read by a young reader. It offers a lot of encouragement and made my son feel proud when he was able to work out new words like 'bug' and 'Fred'. At the end of the book there are some simple comprehension questions which also give a sense of achievement. The illustrations are nicely drawn and help the story without being too full of information which distracts from the text. The story itself is 41 pages long, which seems a lot, but because there is very little text on each page it's not intimidating. I really like this book. My son really likes this book and his 3 year old brother enjoyed reading it with us. It's perfectly timed as my 4 year old will be starting school in 2 weeks, and his brother will be starting nursery, so they're both concerned about that at the moment. The subject matter is interesting and the story captivating, so neither of them realised they were actually 'learning', they just felt they were reading a story with me. We give this book a good 4/5. 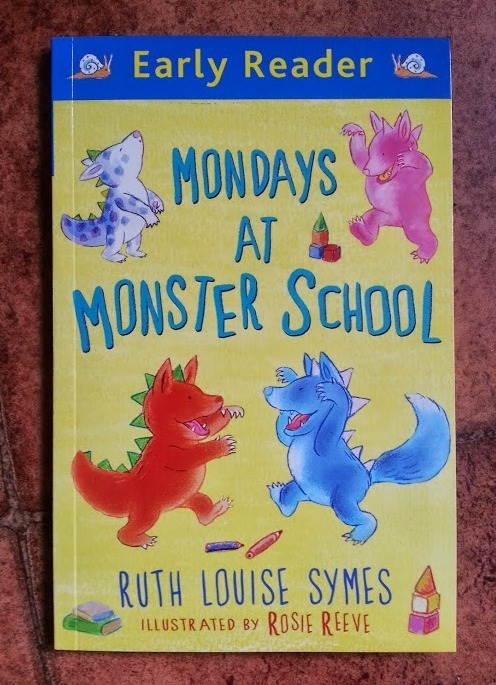 Mondays At Monster School is published by Orion Books and has an RRP of £4.99. It is available from all good bookshops, or as a download. Aww, it sounds like a lovely book. Matti was so thrilled when he started getting books he could read some of the words in - made his day. I've been reading this to Monkey today, love the simple language. Kept him enthralled as he moves to school nursery in a couple of weeks too.